The very mention of the Klondike Gold Rush conjures images of snowy mountain tops, babbling brooks, burly unshaven men. and robust women– the kind you don’t take home to mother. There is no denying that prostitution played a role in Yukon. On the infamous Paradise Alley alone, there were seventy small cabins, each housing a different call-girl. Many of these women had fallen prey to charismatic pimps who persuaded them across the Chilkoot Pass. In the end, they were little more than white slaves. If not plying the oldest profession to a bountiful and captive clientele, what might attract a woman to the Klondike Gold Rush? Some wanted to escape the confines of Victorian expectations. In the Klondike, a woman could dress like a man and do the work of a man without judgment. At home, only financially destitute women sought employment. They were funneled into mindless factory jobs that required little skill. Even then, they were expected to give their position up to the first suitable male candidate that came along. A woman’s place was, after all, in the home. In his book The Klondike Quest, Pierre Berton tells the story of one woman’s tenacity. She kneaded dough for bread but it refused to rise in the cold temperatures. The woman carried the dough on her back, next to her skin, so her body heat would cause the dough to rise. She then baked the bread and sold it for a handsome profit to fund her journey. There would have been no Klondike Gold Rush if not for Yukon woman, Shaa Tlaa, also known as Kate Carmack. The discovery of gold is widely credited to the men in her family: George Carmack (husband), Skookum Jim (brother), and Dawson Charlie (nephew). According to author Fred N. Atwood, it may have been Kate who found the first nugget. While salmon fishing at Rabbit Creek during the summer of 1896, gold was discovered by “…while Carmack was resting, his wife in wandering around, found a bit of bedrock exposed and, taking a pan of dirt, washed it and found that she had some four dollars in coarse gold.”– The Alaska-Yukon Gold Book. Actresses like Klondike Kate and Mae Field entertained in theatres, saloons, and dance halls; they were embraced by polite society. Their income, at roughly $200 per month, exceeded the earnings of Sam Steele and his Mounties. While not engaged in prostitution, their creative entrepreneurial spirit did lead them into mischief. Klondike Kate dressed as a boy and hopped on a scow pulling away from the dock so she could avoid being turned away at a Mounty checkpoint. Over the course of 52 days, Grace Bartsch and her husband, Chris, drove a herd of 500 sheep, 50 cattle and one goat to Dawson City. Her diary gives an account of the difficult journey made partly on horseback and partly by train. 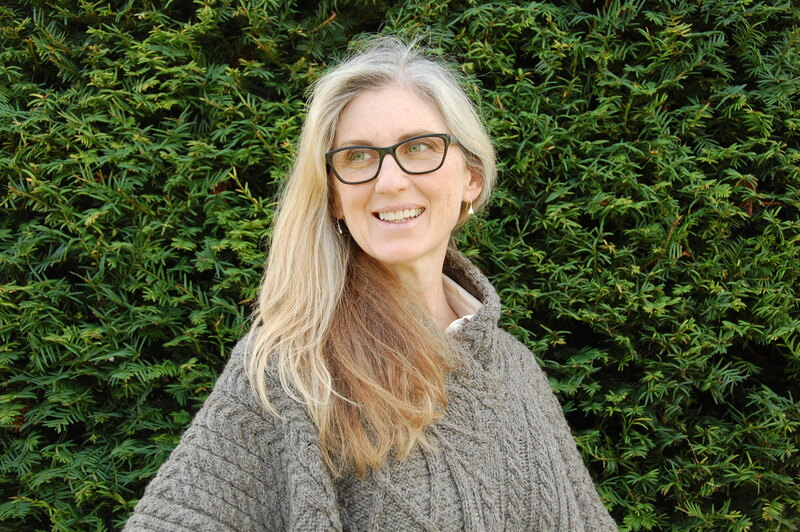 Dr. Lydia Clements left her successful practice and her dentist husband in Brooklin, to pursue what she thought would be a fruitful medical practice in Dawson. She was the only member of her party to completed the expedition and, quite possibly, the first woman from the eastern USA to cross the Chilkoot Pass. She opened a medical practise in Dawson and staked several mining claims. 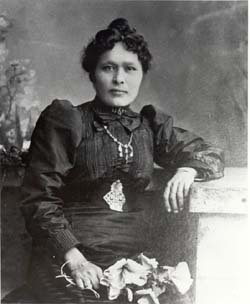 She travelled home many times but always returned to the Yukon, refusing to be defeated a succession of financial losses. 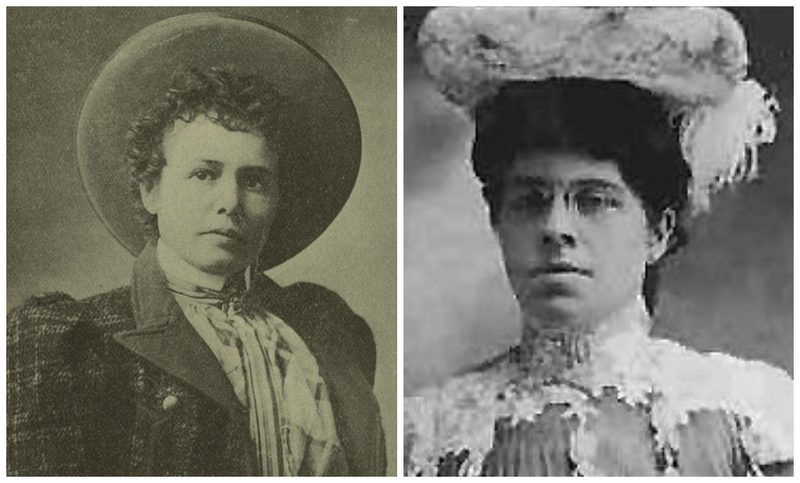 (Left) Dr. Lydia Clements –Print Collection portrait file. Belinda Mulroney was legendary in her ability to turn a profit. She made her way to Dawson City carrying items for sale: silk undergarments, cloth, and hot water bottles. Her profits allowed for the purchase of a restaurant that, in turn, generated sufficient funds for the building a two story hotel. Visitors to the hotel offered her valuable information about mining opportunities. Inside of a year, she owned five mines, either outright or in partnership. Her profits here allowed her to establish the luxurious Grand Fork Hotel. She was also invited to manage the struggling Gold Run Mining Company which she did, successfully bringing it into the black inside of 18 months. very interest stories and great photo assortment! love your blog!! Thanks so much Eddie. I enjoy the process of pairing the right visual with the text. See you again soon. It was a treat to see my writing conveyed in Italian — brutale traduzione or not:) Also, I so loved your phrase, “If you want to hear, the message arrives.” Lovely. Thank you for sharing my work. There are so many stories from those days that we may only get a glimpse of. I just found a very brief comment about a woman who may have been the first white woman to cross the Chilkoot – http://www.explorenorth.com/library/bios/ferguson-margaret.html If the dates are correct, she and her husband were prospecting in the late 1880s,several years before the big rush. Hello Murray! I’ve read The Klondike Quest by Pierre Burton’s and Charlie Wilkin’s book, The Wild Ride: History of the North West Mounted Police 1873-1904. The latter covered a lot of the gold rush as well. I just picked up a copy of Charlotte Gray’s work, called Gold Rush. I’m really looking forward to that. I will skim the indexes to see if there is any mention of Mrs. Ferguson. What an interesting find. I joined your Yukon History group. I’m so glad you visited, Murray. I will look forward to your group’s posts. Cheers! Hi Gwen. I bought The Klondike Quest when if first came out – it was incredibly expensive back then, but was worth it. I haven’t seen Wilkin’s book but Charlotte Gray’s is excellent. The Yukon History group is only 4 days old, but I think has great potential to share information. There is SO much virgin territory here for historians! Your words and page area inspiring, Gwen. I’m flailing around in design land and expect to for long while yet. Cheers. Bonjour Ms. Funkhauser! Thank you for the fine complement. I’ve visited you and would have to say that your ‘flailing’ looks like good form:). It exudes personality. Flailing works for me. I shall continue in good faith. Hello Kathleen. It’s a pleasure to meet you. What an interesting piece of family history. I do hope you will write back if you uncover any information about your aunt. I wonder if there might be a ship record you could attain. The NWMP (Northwest Mounted Police) custom house checked everyone passing through the Chilkoot Pass on their way to the Klondike. You might try searching for archived records of the custom house. Great post, and fascinating women. The photos give a hint of the hardship and of the mettle those women showed. Thanks for sharing it, Gwen. Very nice to make your acquaintance. I’ve visited your ‘About’ page. It seems we’re on a similar mission. I had a short story published last year that was inspired by what I’ve learned about my own Irish ancestry. My folks arrived in Bytown in 1830. One of my ancestors farmed for the Clements Estate. Have you heard of it? Hi Gwen. My great grandmother married photographer Eric Hegg when she went with him to Skagway. She had been divorced from a man with the last name Sinclair, and had a young daughter, my grandmother, who she left in a boarding school in Portland. The family lore is that she made the money taking pictures, but now reading about Hegg, I see that he was the main photographer of the gold rushes. If you know anything about her I would love to hear. Her name was Louella, but she was called Ella there. They had a “bitter” divorce in 1902. Hello Anne! Thanks for your patience in awaiting my response. I did an enquiry on the Library and Archives of Canada website. I searched Heggs. At this link http://www.bac-lac.gc.ca/eng/collectionsearch/Pages/collectionsearch.aspx?q=hegg&amp; you will find links to his work in the archives. One of the photos shows the photography ‘shed’ he worked from. Perhaps your great grandmother will be pictured in some of his photos. How wonderful that would be! I searched both Ella and Louella to no avail. Perhaps if you dig deeper there you’ll find something. I’m very intrigued by your great grandmother. Please do let me know if you unearth anything new!